All year around Modern Lake front home. with 60 Ft of lake frontage . Newly remolded to enclude patio to enjoy outdoor dining and relaxing .The home has central air for those hot summer nights . The lake house has just had a face lift . With new siding ,new patio sliding doors. New interior floors and A beautiful new deck and lower level stone patio. size bed, Loft Sleeping area 3 single beds one queen bed and sofa sleeper . This area can sleep 6 Great room 55 inch flat screen T.V. 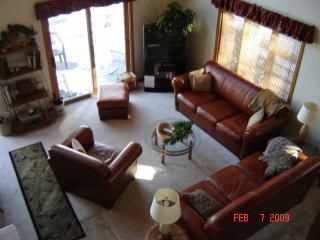 Blue ray dvd and stero. .
Dinning area seats 10/12 .Great room and dinning area has a perfect view of the lake . Two double sliding glass doors off great room to wrap around deck . Deck shaded for evening dining . Lower level Private bedroom suite,one twin bed,and one double bed . family room, pool table ,dart board and stero and DVD and vcr player , free Wifi .dry bar with mini refrigerator. Low level doublefuton sleeper sofa, full bathroom/shower. Utility area has washer and ,dryer.Two sliding glass door walkout to patio and lake front. 16 ft canoe. sandy beach area . Bring your boat ,we have parking at the pier !!!! miles north of Chicago. and 15 miles north of Lake Geneva. Lots of golf courses in the, area. Grand Geneva,,geneva national . Evergreen ,Eagle ridge . 20 pier for docking your own boat . Upper deck Dining table Lower patio Gas grill ,fire pit Dining ,and setting . Provide us with your shopping list and we will have your pantry stocked for you when you arrive.A small fee for this service. Private chef for special events Looking for a think tank? A quite place for that company managers meeting. We will provide the space you need and even cater in the food. Food provided by profesional catering company . We spent a wonderful week on Lauderdale Lakes in this charming home! The location is great and the lake is more useable due to the quieter area compared with Lake Geneva. We jet skiied and sun bathed on the new dock. The home itself was perfect for our group of 8. A state-of-the-art grill and smoker made for terrific meals on the beautiful large deck over looking the lake. The owner was very responsive and whatever info or assistance we needed, she was able to supply instantly during our stay. This home is exactly as advertised and the memory of early morning coffee on the deck with that magnificent view lingers with us still. I rented the lake house for a week late September and couldn't be happier with my stay. The location was right on the lakefront which offered an amazing morning view from their back porch. Nothing better in the morning then the sun rising over the lake with a hot cup of coffee! I was there for business, but the lake house and surroundings made me feel like I was on vacation. The location was perfect for my trip and gave me a centralized location to conduct my business in nearby cities. My associates all had a comfortable place to stay with the bedroom arrangements and the two full baths were a lifesaver. The neighborhood is lovely and the locals are very friendly. There is a bar/restaurant within walking distance with good food and better cocktails! The service and staff were awesome! I would definitely recommend this rental and I plan on staying there again the next time I am in town. Lake Geneva 15miles south, . southern Wisconsin. Elkhorn host the annual county fair. Visit Old world Wisconsin ,out door Museum , Alpine Valley winter sking and summer golf and music concerts. Milwaukee host many lake fron events.. Germanfest, Irishfest,and many concerts, all atractions with in 30min drive. Nightly Rate: $500 - $900 Weekly Rate: $2000 - $3300 Monthly Rate: $3000 - $8000 summer rates April 1. -Oct 1st. Summer midweek Discount arrival Monday /depature Friday 4pm $2300 $750 deposit required full payment 1 month piror to rental $3300 per week --Holiday weeks $3500 $1500 weekend rates off season $1800 summer limited weeks $2000 fallwinter rates per week $3500Christmas and New Years Week $500.00 single nite rate three nite min. off season only weekend special Jan 10th. throw April 1, $1000. April1 -may15th. $1500 No prom parties No pets. NO SMOKING Cleaning fee of $100 for weekend rentals only .